We are highlighting two exciting New Book Releases for March 2019 from our New Book Releases List (click to see all the new releases). If you are looking for something new to read this is a great place to start. Have you ever heard that it takes hard work to be successful? The answer is probably yes, but no one ever tells us the day-to-day grind of working hard. How do we deal with the different trials of becoming successful? 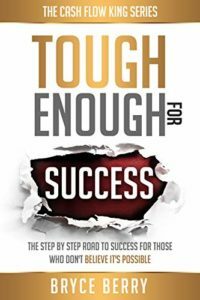 Tough Enough for Success looks to answer those questions because we all deserve a shot at success. We all want to be successful but sometimes we just don’t know how to go about it. Most people just need a small nudge or a guide to keep them on track. Its OK because you are going to learn how to be tough enough! This is a simple do it yourself guide to success. This can be beneficial for almost anyone! The best part is that you can choose how vigorously you want to follow this because it is truly meant to fit everyone’s life. These things can help you redefine your life and find happiness and meaning. I want everyone to do what they love and be successful at it! Master Servant leadership like a Pro! It’s time to own it! Are you struggling with individuals you don’t directly manage? Are you ready to crush self-doubt? Are you tired of being told you wear your heart on your sleeve or are an emotional leader? Stop the madness of compassion fatigue for good! Imagine eliminating the weakness associating with serving to lead and feeling passed over for not being as aggressive as your colleagues! Discover what value you bring to the table and how to make others see it too! Have others follow your lead as an influential leader, while still putting your people first! 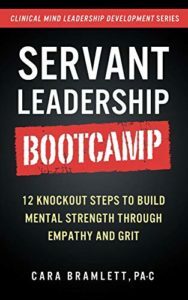 Servant leadership is the most powerful and influential leadership style. With the people-centered approach, you can join the ranks of those who lead by serving and create your dream team. This is a reality. Your quest is over and the answers are here! Let this little how-to book walk you through building your mental strength in a knockout 12 step bootcamp! Start your journey with an eye-opening mental strength quiz and finally know your mental toughness! Weak leadership? Give It All Up! Gritty leaders understand the pitfalls of self-control and use it to their advantage. Click here to continue reading the complete book description on Amazon.